A conspicuous plant, at least as large in all its parts as B. lactea, but pubescent, with large stipules, persistent bracts, and cream-colored flowers. 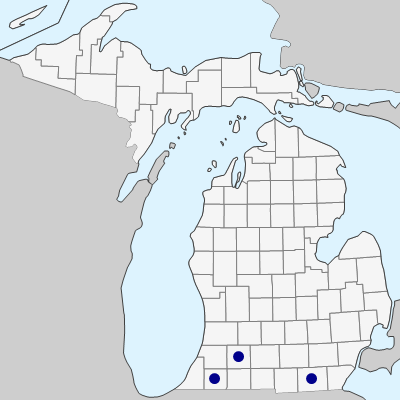 Known as a native in Michigan only from Cass and Kalamazoo Co. but collected recently; the Lenawee Co. record is spreading from a prairie planting. 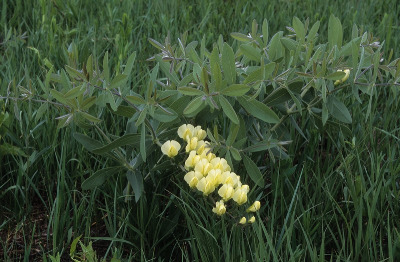 Sometimes recognized as Baptisia bracteata Elliot var. leucophaea (Nutt.) Kartesz & Gandhi. MICHIGAN FLORA ONLINE. A. A. Reznicek, E. G. Voss, & B. S. Walters. February 2011. University of Michigan. Web. April 18, 2019. https://michiganflora.net/species.aspx?id=1276.